The Rose family were among the earliest colonist of Jamaica. Dr Fulke Rose and his brothers Thomas and Francis were patenting land from the early 1670s onwards, and the family plantations and name persisted throughout the following century. After the death of Fulke Rose, his widow married Sir Hans Sloane among whose many claims to fame was his wonderful book on the natural history of Jamaica, the result of a short visit he made in the 1680s. Another brother John Rose was a London merchant who traded with Jamaica and who carried convicts and indentured labourers there in his ships. 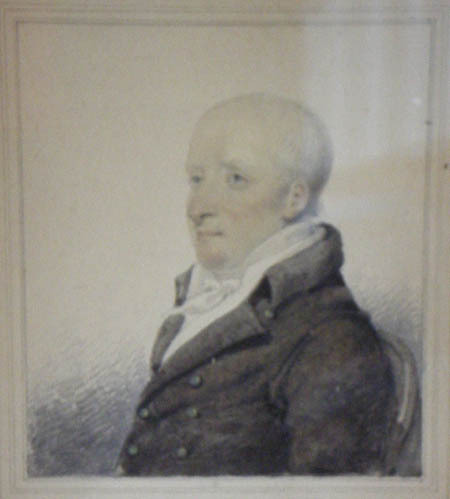 Less well known, in connection with Jamaica, was their brother William who was an apothecary in London and who seems to have acted in some capacity as family banker. Fulke Rose’s Will mentions that William was paying a family annuity to their aunt Margaret Tudor, and that he was holding £1500 on behalf of his brother Fulke (equivalent to about £2.8m today relative to average earnings – source: measuringworth.com). The trade of an apothecary is one we no longer have, and to some extent this results from a court case involving William Rose. Generally speaking there were three providers of medical services at the time, not counting midwives who were generally women. There were some men midwives, who were not doctors, as childbirth had not yet become medicalised. Surgeons performed basic surgery, without of course benefit of anaesthetics or antiseptics. So they worked fast to reduce shock and blood loss, amputating crushed limbs, setting broken bones, bleeding patients and generally dealing with the mechanics of the human body. They would learn their trade by apprenticeship to another surgeon. Physicians were the top of the medical tree, and might be university trained, for example Dr Rose Fuller, Fulke Rose’s grandson, trained at Leiden in the Netherlands. They diagnosed ailments and dealt with a wide variety of illnesses and conditions – inevitably with varying degrees of success. A good bedside manner was worth money and the fees they charged related as much to this as to actual treatment success rates. They would prescribe bleeding, cupping and blistering, and would write prescriptions for medicines containing things such as scorpions and crushed woodlice, as well as the opiates mentioned in last week’s posting here. Those medicines would be made up for the patient by the local apothecary. Unlike today’s dispensing chemist however the eighteenth century apothecary also provided medical services to patients in his area, who would consult him because he was cheaper than a physician. The physicians however jealously guarded what they regarded as their monopoly over the right to diagnose and prescribe. This came to a head in 1701 when John Seale, a butcher from Hungerford Market, came to consult William Rose who was practising in the parish of St Martin in the Fields in London. Seale was probably suffering from a sexually transmitted disease and over a period of months William tried various remedies without success. Eventually he presented Seale with a bill for £50, a considerable sum, possibly designed to try to get rid of a troublesome customer! Troublesome he certainly was. Seale went to the Royal College of Physicians to complain and William was prosecuted before the Court of the Queens Bench for practising illegally as a physician. The case was debated over a considerable period of time and eventually judgement was given in favour of the Physicians. However William’s case was taken up by the Society of Apothecaries who applied for a Writ Of Error and they argued that ‘… selling a few Lozenges, or a small Electuary to any asking for a remedy for a cold, or in other ordinary or common cases, or where the medicine has known and certain effects, may not be deemed unlawful or practising as a physician, where no fee is taken or demanded for the same. Furthermore the physicians, by straining an act made so long ago, may not be enabled to monopolise all manner of Physick solely to themselves and be an oppression to the poorer families not able to go to the charge of a fee’. The argument was as much about money as it was about medical practice. The physicians feared that the apothecaries would poach their business and they would lose fees. However the apothecaries argued that there were not enough physicians to supply the medical needs of Londoners, whereas the many apothecaries living among their clientele could be on hand day or night. William won his case on appeal in 1704, and the physicians went on to undercut the apothecaries by setting up free dispensaries for the poor! However, the ruling is now regarded as marking the beginning of the establishment of General Practice in England, and William is remembered in the Rose Prize of the Royal College of General Practitioners – ‘For original work in the history of general practice in the British Isles’. 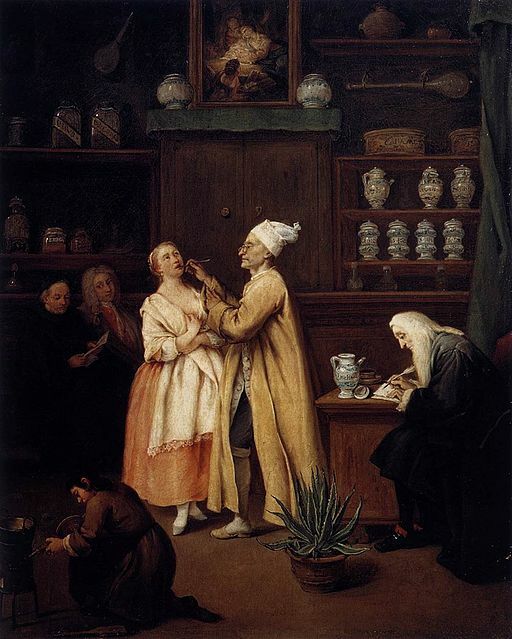 The picture above, by Pietro Longhi (1702-1785), from Wikimedia Commons, shows an eighteenth century apothecary examining a patient. The seated figure is perhaps the physician writing his prescription. The large plant on the floor looks like an aloe vera which is still used today, and is common in Jamaica where its uses in herbal medicine have long been known.